Preheat oven to 400 degrees. Grease an 11 x 16 jelly roll pan or a 9 x 13 pan and line with parchment paper. Separate eggs. Beat egg whites with salt until they hold soft peaks. Gradually beat in sugar, sprinkling it in a little at a time. Continue beating until whites are very firm, about 5 minutes in all. Stir yolks with a fork to break them up. Add vanilla. Fold a quarter of the stiffly beaten egg whites thoroughly into egg yolks. Pour egg yolk mixture on top of remaining whites. Sprinkle corn starch and flour over mixture. Fold all very gently together until no pieces of egg white show. Careful not to overmix. Pour into prepared pan, spreading batter evenly. 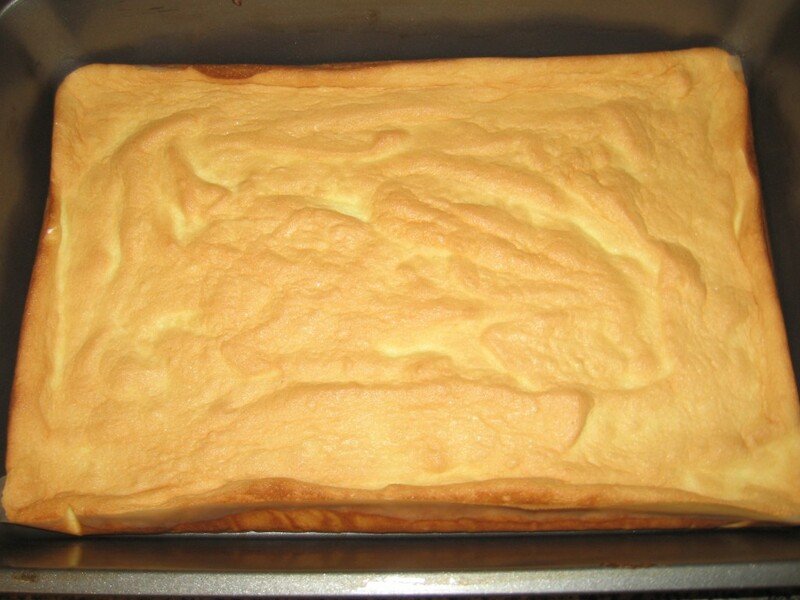 Bake 10-12 minutes or until cake is very lightly browned.